In the past few years, hardly a quarter goes by without the news headlines announcing another mine brought to a standstill—or a new project stalled—by public protest or community discontent. Many such incidents have sadly been associated with violence and destruction and there is seldom a winner in the conflict. Investors lose money, governments lose potential revenue and communities lose the possibility of jobs and livelihoods. In most cases, she says, this outcome could be avoided—by a greater commitment and skill applied to the process of social engagement. What the sector needed was a new cohort of skilled professionals to assist companies to comply with new legal requirements that involved engagement and consultation; this was an opportunity she grasped. The new political dispensation placed greater importance on the views of stakeholders like communities and labour—voices that had previously been marginal to decision-making. The skill sets to provide these services were only just being developed and many women were raising their hands to take up the challenge, according to Vassie Maharaj, who is a Director, partner and Principal Consultant in stakeholder engagement and social risk management at SRK Consulting. Her work has taken her all over the world; while South Africa has been at the forefront of codifying these social licence requirements into law, most countries have embraced the need for broader and more effective consultation before development decisions are made. Regarding her position as a woman in this predominantly male industry, she says she has never been made to feel less than equal to her male colleagues. “I have always been impressed by the professionalism of the mining sector and the acceptance of any person who has value to offer,” she says. Indeed, she was mentored by a woman—one of the pioneers in the field of public participation, which set her on the path on which she has been honing her skills since 1998. Among the challenges in the early days of public participation interventions, she says, was that many clients embarked on these processes quite begrudgingly—placing added pressure on the practitioner to convince the client of the value of what could be achieved. While the concept of engagement is relatively simple—that is, to provide information and to gather feedback on an ongoing basis—the practicality of implementation becomes very complex. “One of the challenges of this work in a country like South Africa is that economic inequality creates different worlds and life experiences, and outlooks can be so different within one geographic space,” she says. But she made the most of the growth opportunities in the early days of her career when there was substantial work to be done at strategic and policy-making levels regarding the implementation of public participation strategies. Today, many mining companies are reaping the benefits of the steady growth in the capacity of the public participation profession. EY’s latest mining report notes that successful mineral companies have highlighted the value of operating in tandem with communities and have shown that it is possible to engage through mutual value creation. It is also telling that consulting engineers of the stature of SRK Consulting place such emphasis on this discipline, and that, today, it is an increasingly vital component in the company’s arsenal of technical and scientific offerings. Starting out her career with a BSc degree in biochemistry and physiology, Maharaj could have stayed in her successful trajectory as a Laboratory Manager, a position she had achieved by the age of 32. However, her interest in communication and marketing beckoned her in another direction and she began writing minutes and reports for public participation processes. 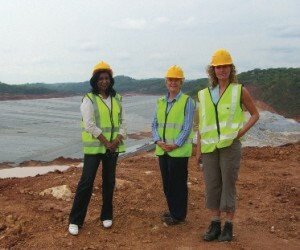 So began her immersion into this new world within the mining sector, where women can discover vocations they could barely have imagined just a couple of decades ago. 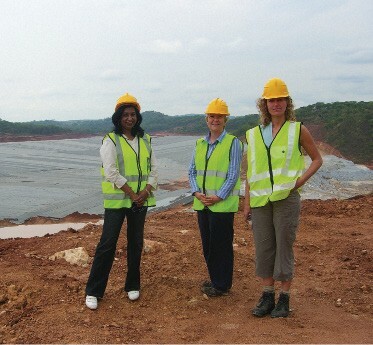 It is also significant that Maharaj’s leadership role in the business brings her skill set to the highest levels of decision-making, alongside more established disciplines such as geology, geotechnical engineering, hydrology, mining and civil engineering. As many projects will look for funding from development finance institutions like the World Bank, the International Finance Corporation and the African Development Bank, these organisations have set their own standards and frameworks for lenders to follow.